Marine coolers are by far and stronger than regular coolers. Subjected to the crashing waves of either saltwater or freshwater, while being exposed to the scorching sun and harsh weather conditions, boat coolers are build to stand these tests. Having a boat cooler offers many benefits, especially long ice retention time, as you’ll need to keep your catch cold throughout the trip. If you fancy having one, you should take into consideration all the factors mentioned above. Because it can get daunting when looking for the best choices available on the market. We’ve also included a buyer’s guide information so that you have enough information to choose the best boat cooler on your next fishing expedition. Now with everything out of the way, it’s time we take a look at the main topic of discussion. Mind you; we’ve done all the hard part research all you have to do is find the cooler which suits your needs. 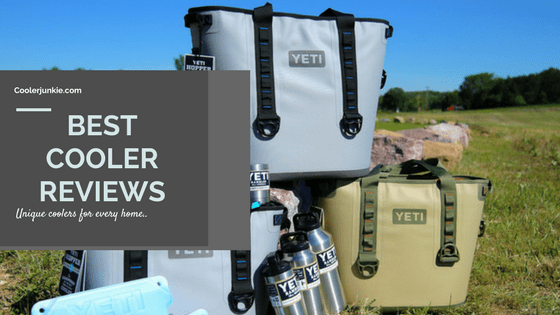 The first marine cooler on our list is the Yeti Tundra 65, and for those who don’t know, Yeti is perhaps the most popular cooler brand in the world. 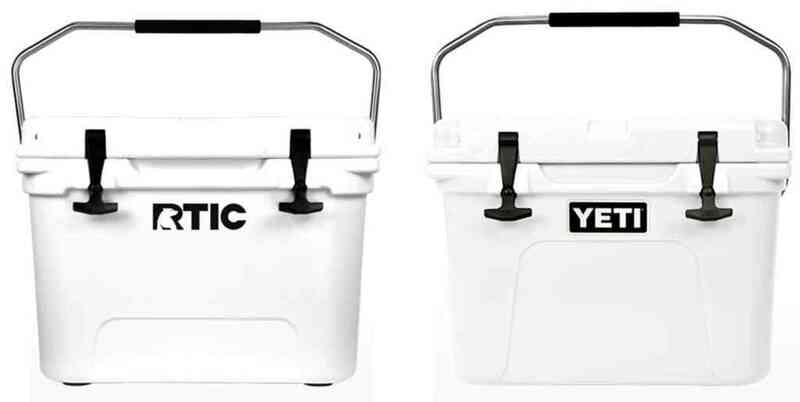 Known for their rugged, rotomolded coolers, Yeti has earned a reputation in the ice chest world. Speaking of the durability, it has a rotationally molded body designed to withstand adverse weather conditions. 65-quart space means you get enough storage space to fit not only fish but lots of food and drinks as well. Constructed with permafrost insulation with an extra thickness of up to 3 inches, expect your catch to stay cold for days. That said, this cooler is certified bear resistant. One thing we like about the ice chest is the non-slip feet and the molded tie in downs, this holds the cooler in place even against the caprices of the sea. The cold-lock gasket blocks out heat while the cold stays in. The latches are made of an ergonomic heavy duty rubber which feels comfortable in hands. Expect to lug around the cooler with ease. It comes with Lipgrip handles which don’t come in the way when carrying the chest. For added durability, the cooler is reinforced by the military grade polyester handles. The cooler feature a fat wall design which keeps your fish cold for days. It comes with non-slip feet and tie-down slots that hold the chest in place. The igloo marine ultra cooler is the harbinger of a great fishing trip. With a stain and odor resistant liner, the igloo is the ideal marine cooler for you. 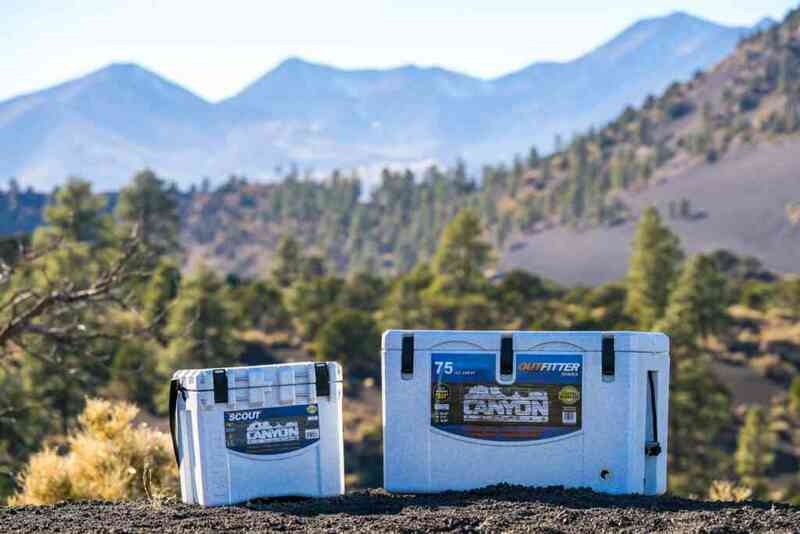 The cooler utilizes an ultra-therm insulated body to keep your items frozen. The best part is the measuring tool that comes handy for measuring your catch. You should know the cooler comes in in various sizes from 28-128 Quart. In terms of retaining ice, you can get a full two days of solid ice. This means your catch gets to stay preserved without causing a stink. Exposed to salt water, fear not. The cooler is corrosion resistant, thanks to the polyethylene material and the stainless screw at the hinges. A drain plug is fitted to efficiently drain water entirely, as it helps increase the ice retention period. We didn’t find anything doesn’t sit right; however, some user’s complained the lid being entirely uninsulated. Another noted that the lid often leaves a small gap, just push it down and you won’t have any problem. 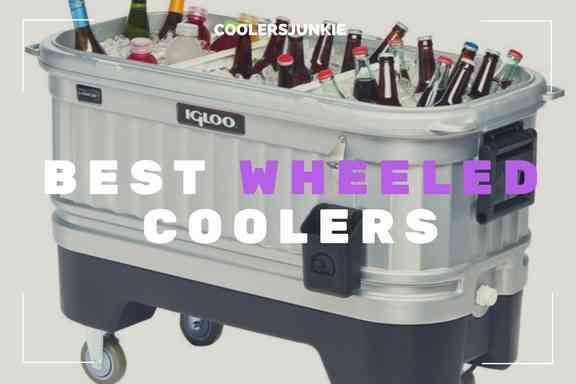 Impressively, the cooler is lightweight, and you can lift, carry and even roll the cooler on wheels. It shouldn’t come as a surprise; the Engel Deepblue can hold ice for an excess of 10 days. Little wonder why it’s the best rotomolded marine cooler on the list. The deeplue cooler kicks in with an all polyurethane insulation with the airtight Arctic vault gasket. The result is longer ice retention period. As this is a marine cooler, it comes in white, enabling the product to reflect most of the sun and heat. The Engel deepblue offers robust silicone airtight gaskets. You will like the idea that the marine cooler has corrosion free latches, keeping the lid sealed at all times. With a molded plastic on the rear of the lid, be rest assured the marine cooler is bear resistant. The fitted drain plugs at the bottom mean you can conveniently empty water without hassles. On the downside, many users complain about the lid not able to seal properly. Aside from that, I don’t think there’s anything you should be worried of. In all, a rotationally molded construction and UV-resistant ice box is all you need to set sail on the fiercest waters. The Pelican ProGear Elite is a large marine cooler that provides convenience to fishing enthusiasts. With enough space, you can store your catch and still have enough room to fit your food and drinks. If you want to lift or carry the cooler, you can be able to do so, thanks to the convenient dual system. Although huge, it’s relatively easy on the hands. The press and pull latches ensure opening the cooler a breeze. That said, it features molded tie downs that hold the cooler so that it doesn’t slide off the boat. Believe it or not, after multiple testing and reviews, the pelican can retain ice for as long as 5-7 days. 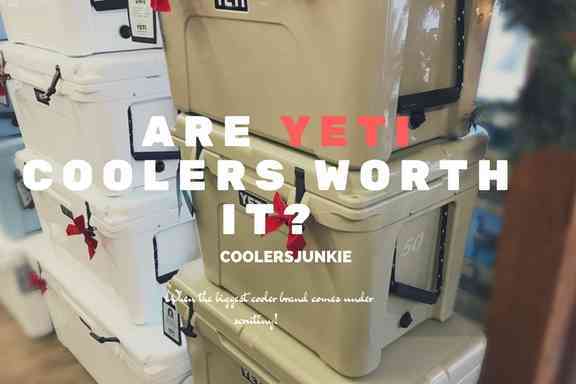 Yes, the Yeti hopper is not as hard sided as the other coolers on the list. However, it’s not soft either. It will come as a respite to limited space in fishing boats. 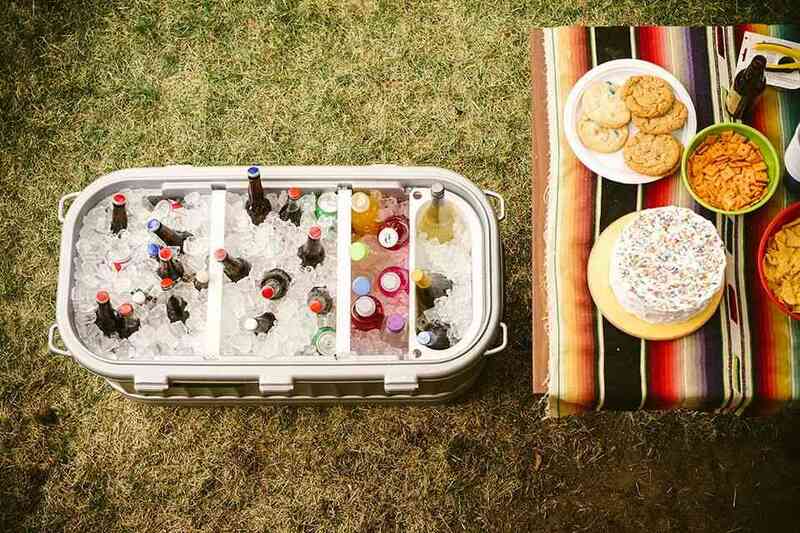 The Yeti hopper can be squeezed into areas a hard cooler won’t fit. A detachable shoulder strap and fitted handles on the sides enhances users to carry with ease. The Hopper offers an innovation closed cell foam for extended ice retention, a feature you won’t find in soft coolers. It’s also encased in a waterproof dryhide shell preventing punctures and abrasions. Unlike some soft-sided coolers, the hopper can take any abuse. One cool thing is the hydrolok zipper; it seals the cooler while being able to keep it airtight. The hopper also provides some compartments where you can store your accessories. This chest is not perfect as there are some flaws with it, for starters, the cooler has flimsy zippers and the price. If you have a beefy budget, don’t get past this great marine cooler. If you are the patriotic type that like to use a Native product, then you’ll be glad to know that the orca boat cooler is made is the USA. This ice chest is perhaps the most expensive on the list, but it’s worth every dime. The orca utilizes a white rotationally molded body designed to repel heat when exposed to the sun. Stainless hinges ensure the product stays rust-free, while its rugged body is grizzly bear resistant. Additionally, the lid gasket is made dexterously for tight seal making your catch stay cold throughout the trip. This orca comes in an array of colors while the sizes range from 20 -75 quarts. Like any other cooler, the orca too, has its flaws, first is the lid leaves a space and does not entirely seal until pushed down. Ignore this problem, and you’ll have a top-tier marine cooler on your next fishing trip. If you are looking for a cheap alternative to Yeti coolers, don’t look further, the ORCA heavy duty fits the bill. Because of the name, Grizzly cooler might seem confined to one function, protection against bear invasion. But what if I told you it does more? This versatile cooler is made of a double wall rotomolded plastic, polyurethane insulation, and thick rubber gasket. All this combination makes the grizzly overwhelmingly durable and perfect for outdoor activities. The cooler promises outstanding ice retention for 4 days. Large mold-in handles are included for easy lifting on/off the boat or the back of your car. Fitted with rubber Bearclaw latching mechanism that completely seals the lid. It’s common for your cooler to stink after emptying your fish; however, the interior is built with materials that are resistant to stink. Just rinse your chest, and all the stink will be gone. The presence of oversized drain means even easier water drainage; there’s a ruler in the lid that helps measure your catch. While there are some obvious flaws like the lack of handles and its massive size, you’ll be happy the cooler includes a lifetime guarantee. The polish white finish and UVGuard material of the cooler offers protection from the scorching rays of the sun. With a 120 Quart size, the coleman has enough room to fit in 204 can and still have some space left for ice. More so, the insulated lid and extra insulation in the walls hold ice for days. It also comes with a cushioned top lid to sit and supports up to 250lbs. The drain plug is corrosion resistant; it is designed in a way that you can drain water completely without tilting or turning the cooler. Up its sleeves, it has four cup holders molded into the lid. Made from smooth materials, you won’t find it hard to wipe it clean. The Coleman is a product that sparks feelings of nostalgia especially if you were born in the 1900’s. If it was based on reputation, only Yeti could match the Coleman on this ground. The Coleman 54 quart is constructed to withstand the rocking waves and rough waters. Thanks to the steel construction material, this product is rust resistant. Grip steel handles & strong stainless steel latch make lifting or carrying the cooler on or off the boat a breeze. One surprising thing is the Have-A-Seat lid which makes for good sitting and relaxing. The stainless lid is a great finishing touch, which ensures the lid remains airtight and ice stays frozen for days. With a 54 Quart capacity and convenient height of 2-liter upright bottles, the Coleman holds up to 85 cans. On a final note, this vintage cooler is the best portable marine cooler that can fit into nukes and crannies on the boat. If you can get your hands on the cooler, you can be able to enjoy its functions while you enjoy nostalgic reminisces about the good old days! Are you the stress-free type that doesn’t like lugging around coolers, why not roll it to the boat? 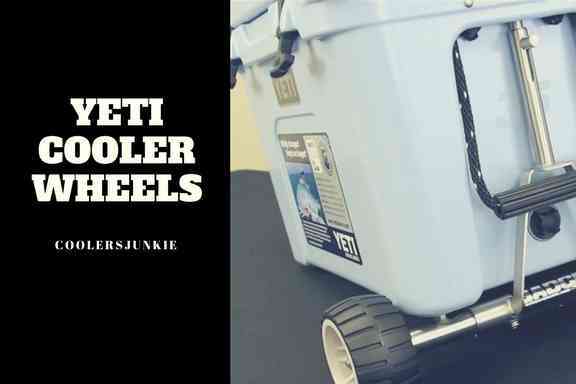 The igloo marine is the only marine cooler with wheels on the list. The ice chest cooler comes in various sizes of 28, 50 and 60 Quart. Find the size that best fits your needs, and you’ll be fine. Built with UV inhibitors & white which reflects sunlight and keeps your catch and drink cold. Molded-in side handles are fitted to the sides for easy handling and lifting in and out of the boat. Unlike some marine coolers that don’t have any storage compartments to keep accessories, the igloo marine has dedicated storage space for valuable items. It has two drink holders molded on the insulated lid, while two more hang on the corners. With never fail wheels and sports side rally wheels, that’ll never scratch the boat surface; you are getting a big catch. Built with corrosion-free materials, you’ll never have to complain of rust after hitting salty waters. Outstanding features like the detachable fishing rod holders, drip resistant drain plug, and telescoping handle with a push or pull mechanism, will only make you love this high-end marine cooler. Well, there goes our top 10 marine coolers. There are various factors to consider before you pick a new ice chest, Ice retention and durability are only few. How about you know everything you should consider before buying a new cooler for your next fishing expedition? Marine coolers or Regular coolers? Are marine coolers better than regular coolers? Standard regular coolers are cheaper; the construction quality is not appealing as we’ve seen most models warp and cracked after being exposed to the sun for long. In fact, marine coolers tend to be more expensive because they are built to withstand adverse weather conditions. Furthermore, boat coolers are subjected frequently to either fresh water or salt water, as a result, corrosion free materials are utilized in their construction. Long Ice retention period – it’s obvious, ice retention is perhaps the main reason why marine coolers edge standard regular coolers. Always choose coolers with high insulation and ice retention periods. 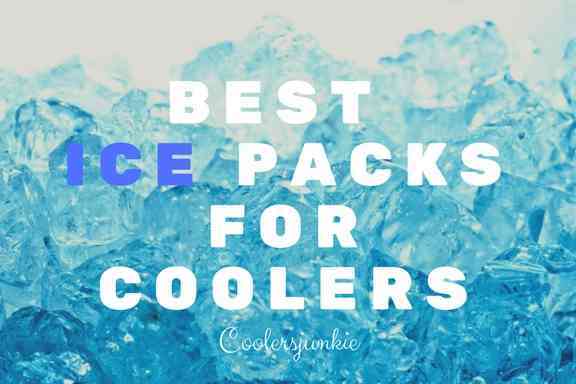 How will you know the highest ice retaining coolers? 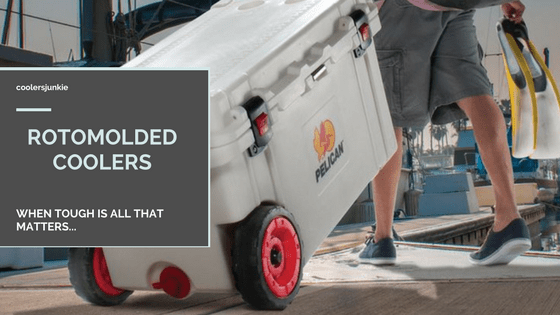 Check our comprehensive list; we’ve added only coolers that fit into the prolonged ice retention class. Measurement Marker – A good marine cooler feature measure markers on the lid for users to measure the length of their catch. Size – The quart size depends on needs of the user. If you are alone, a small soft-sided cooler will suffice, but a larger company might need something bigger. White is Always Better – Don’t get me wrong. Not only are white cooler polish can be used for marine chest. However, white is preferable cause it reflects the hot sun rays along with heat. Although subjective, this factor is great to keep in mind. The best marine coolers come with a flat top for users to sit or relax. Although not as important as other factors, you can make do with a little rest on the lid. Corrosion Free components – Stainless steel components are used to protect marine coolers from salt waters, which might lead to rust in different components of the cooler. 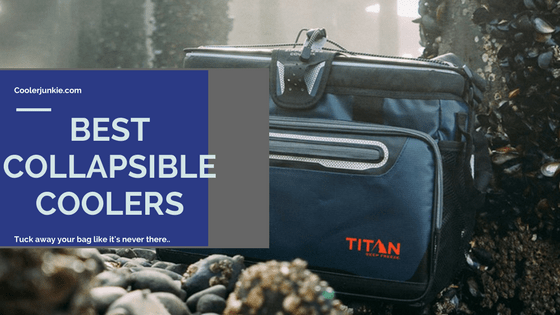 Fish kill bag coolers are especially suited for kayak fishing trips. Some boaters find it more convenient to store fish in a bag. Again, it gives you more liberty to squeeze the bag into any nook on the boat. 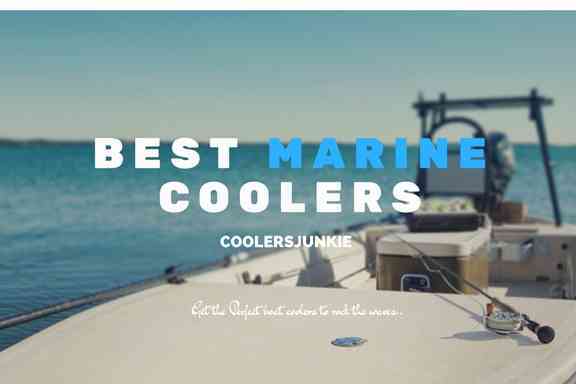 Hopefully, to make things easier for boaters, as well as everyone reading this review, our list and buyers guide should help you pick the best marine cooler that fit your needs. 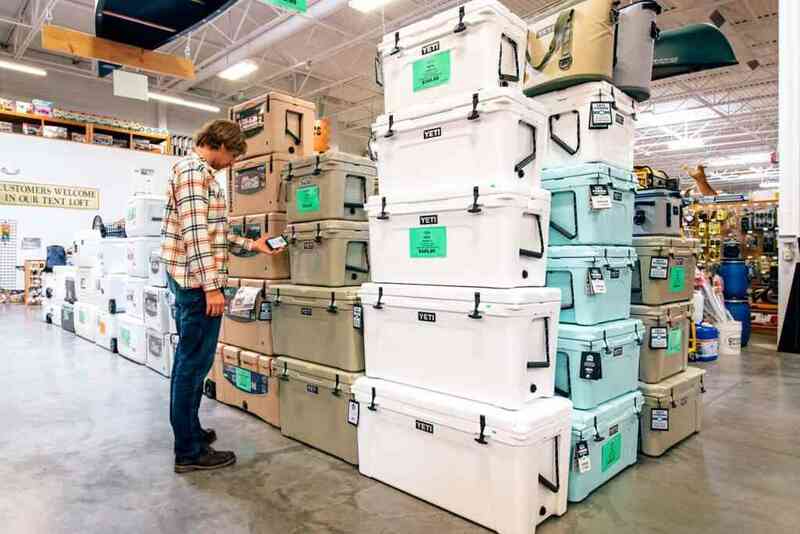 With that being said, the list should solve your boat coolers buying problems, and you will be able to find a cooler that will compliment your style on your next fishing trip.